One of the most common problems when you want to do something in Windows Explorer is it doesn’t show all files and folders by default, and those that have been marked by Windows or anything else as either hidden or protected by the operating system won’t show up. Some malware can actually mark ordinary files as hidden or system which makes them invisible to the average user and you’d think your files were deleted. Windows can show hidden and protected files if you want, go to Folder Options in Control Panel -> View tab and select “Show hidden files, folders and drives”, and uncheck “Hide protected operating system files”. You can leave the setting like that if you know what you’re doing, but for other computers or users, it could prove to be a little dangerous. If you didn’t already know, you can use your web browser to list files and folders on the local computer, and most will show anything protected or hidden by default. Because viruses can tamper with file attributes, using your browser to view folders and their contents to help with removal is useful without needing to use 3rd party software such as Free Commander. Here’s a few popular web browsers showing what files they can view by default. Most browsers will view local drives in some form, this is a just small selection. Simply try typing a drive letter into the address bar of your browser, C: is a good example because you get to see instantly whether hidden and protected items are shown. Usually you can only view the files and if you attempt to run anything except a text based file, the browser will prompt you to download it. 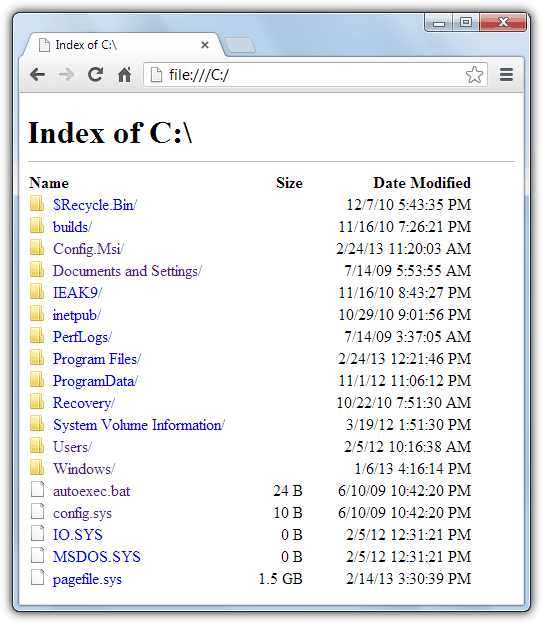 If you type C: or any other drive letter into the Firefox browser address bar, you get to see the files on the drive of that computer. The odd thing about this view is you sometimes get to see the protected pagefile.sys and a few other system files, but not all hidden or protected files or folders. For this purpose, Firefox isn’t really suitable. It will open text based files when you click on them but downloads any other type of file. Google Chrome also has the same functionality but with the ability to also display both hidden files and folders together with hidden protected operating system files. As you can see from the image below, Chrome shows 2 additional .SYS files and the hidden ProgramData, $Recycle.Bin, Documents and Settings, Config.Msi, Recovery and System Volume Information folders. A total of 18 items in view as opposed to Firefox’s 10 items. Chrome will also view text based files but anything else will be downloaded if you click on it. As for Opera, it can also do what Chrome does by displaying all hidden and system files, together with the size and date modified. It also has a few other useful tricks such as being able to view inside zip files like an ordinary folder, and clicking on a file can run it, although the file is copied to a temporary download folder and anything it depends on such as an executable relying on language files or dll’s won’t be copied with it. 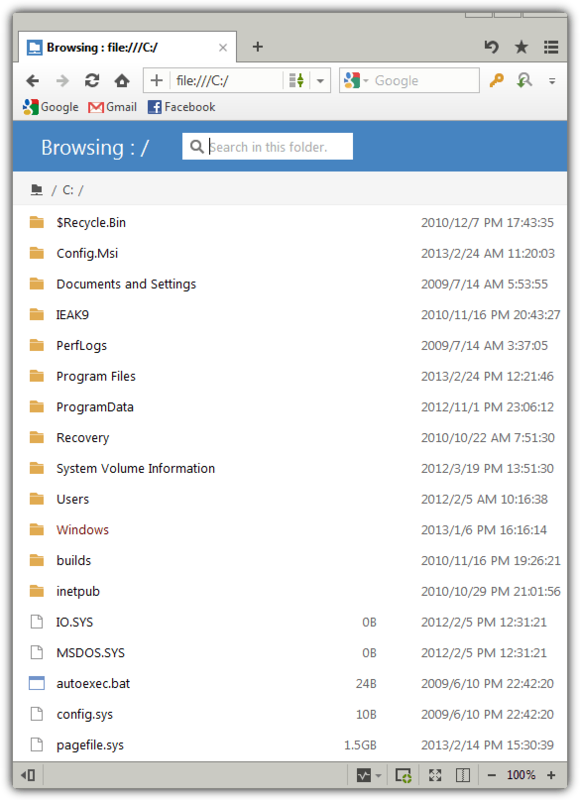 Maxthon can view all system protected and hidden files or folders by default, and also has a useful option to search inside the current folder. Like Opera it can run executable files but copies them on their own to a temporary folder and may fail to run if they’re dependent on other files in the same folder as the original file. Note: Unfortunately, Internet Explorer cannot do this because it’s a part of Windows and works together with Windows Explorer. 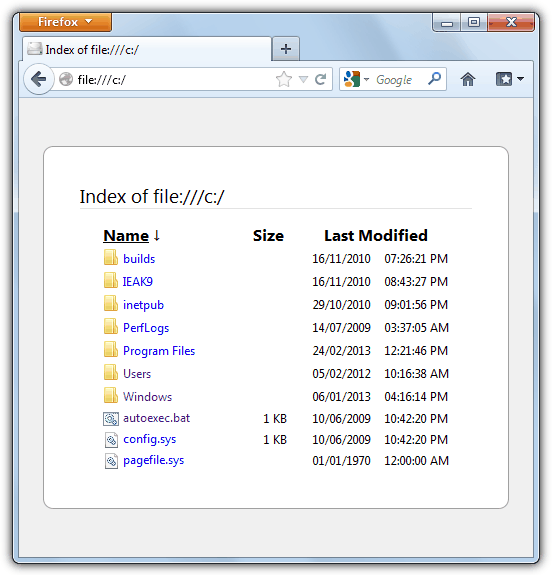 Type a drive letter such as C: into IE and it will simply open an Explorer window and obviously the standard view settings for hidden files are used. Some Internet Explorer based browsers such as Green Browser have the same problem, where others like Avant or Slim Browser can display files and folders in their window but still inherit the view options from Explorer. Hey, what a great posting! Now I can use my browser(s) to view all sorts of interesting things on my computer. Best of all I can print out a listing of folder contents. Thanks, HAL9000. Yet another useful contribution and one aspect of a browser that I didn’t know about. This seems to be much faster than explorer too, at least on my work network. 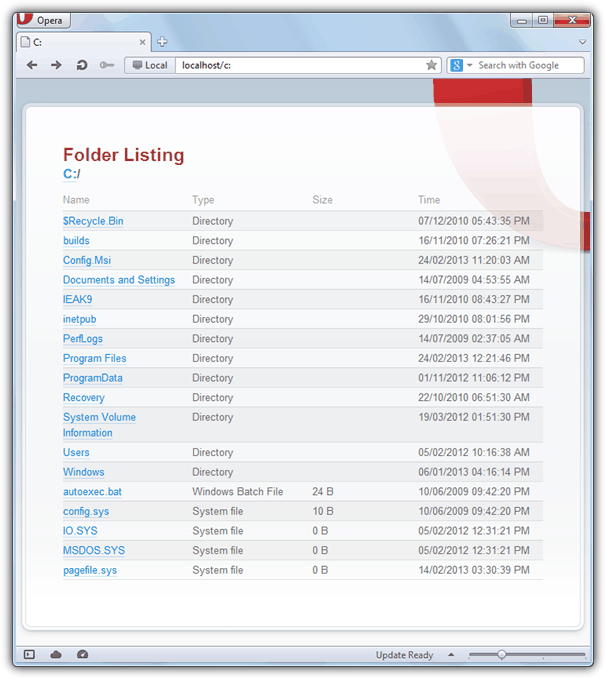 OPERA 11 will not only list the files and folders, it will also run an executable. If you click on it a dialog will ask if you want to save or run the file. In that sense it acts like a file manager. U R A GRT TEACHR! I wonder… How do you have found this???? Many thanks for sharing it!!! Thanks for the useful tip Raymond :D.
anyway, thanks for this info! I see.. Thanks for the info! What is INFO2 File Hidden in Recycled or Recycler Folder?